Carpet Solutions is not only the best choice for carpet cleaning in Pocatello, we are the best choice for upholstery cleaning too! Your upholstered furniture can take a beating, from kids to pets to everyday use, you can’t avoid the build-up of dirt, germs, pollen, dander, stains, and other blemishes. Your upholstered furniture makes your home more comfortable, so don’t cover it in plastic or be afraid to use it, call Carpet Solutions to make your furniture look and feel like new! At Carpet Solutions we believe in using the best, safest, and most natural products for all of our services, and our upholstery cleaning service is no exception. 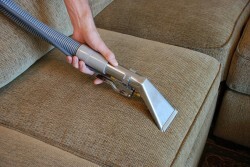 We use “all natural” cleaners to thoroughly and safely clean your upholstered furniture. Our professionals will examine your piece of furniture to determine the fabric content and construction. They will then use this information to determine the most effective and safest way to clean your furniture. Since Carpet Solutions does not use any artificial soaps or detergents for our upholstery cleaning, there won’t be any sticky residues left behind. Your furniture will look and feel great, and stay cleaner longer. Our upholstery cleaning professionals will use their knowledge and expertise to make sure that you get the longest possible use out of your valuable upholstered furniture in the safest, healthiest, and most efficient way.